The name of the Newport Beach Christmas Boat Parade says it all: It's a Christmas parade, a bit like those you might find in small towns and cities all over America. But it takes place in the largest recreational boat harbor on the U.S. west coast, and instead of floats, it's got boats. The Newport harbor parade has been going on since the early 1900s when Venetian gondolier John Scarpa put lights on his gondola and eight canoes and paraded them around the harbor. Today, Scarpa might be surprised at what his simple act has spawned. Newport Beach hosts the largest harbor parade in Southern California. More than a hundred boats, canoes, kayaks, and dinghies participate, each of them decked out in enough lights to almost turn night to day. Some high-end entrants are said to spend more than $50,000 decorating their vessels for the event. The harbor parade is a favorite local tradition for Newport Beach residents, but it's also one of the country's top holiday happenings. If you're visiting during the holidays from another part of the country (or even another part of the state), it's well worth putting on your to-do list. The parade runs for five days in mid-December, Wednesday through Sunday. 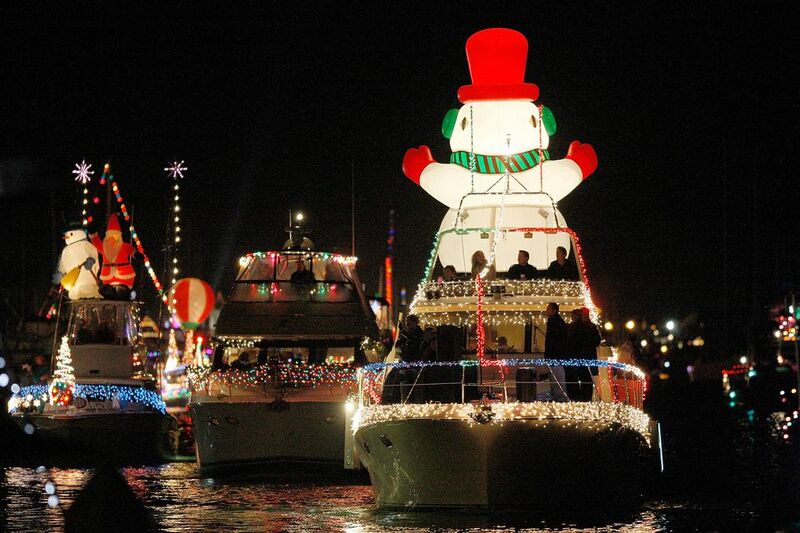 You can get all the schedule details you need at the Boat Parade website. It starts at Bay Island at 6:30 p.m. each evening and finishes at the same spot 2.5 hours later. Each night of the parade features an all-star Grand Marshal who hosts the festivities. Grand Marshals include talented entertainers, athletes, and distinguished members of the community. Opening and closing nights include spectacular fireworks launched from the Balboa Pier that start around 9 p.m. The parade goes on rain or shine but not when the water conditions are unsafe. If the Coast Guard issues a small watercraft advisory notice (which is rare), the parade is canceled. That decision happens nightly at 6:00 p.m., and they post a message about it on the parade website. It's a little hard to find on the parade website, but you can get a reserved spot to see it if you know where to look. Go to the viewing locations page, and click on Reserved Seating to get a list of places that offer it. Newport Sea Base offers pre-parade entertainment, a reserved place to sit, and a reserved parking spot, too. Details are on the Sea Base website. Go to the bay side of the Balboa Peninsula, and watch from any waterfront location where you can find room. You can also watch from any spot along the water on Balboa Island. Try waterside locations along Pacific Coast Highway between Newport Boulevard and the Balboa Bay Resort. On weekends, the boats go into the channel on the west end Lido Isle, and you can watch from the water's edge there. The Marina Park Recreational Center on Balboa Blvd. has plenty of space and also hosts family-friendly activities each night of the parade. If you own a boat, you can participate in the parade. If you don't but want to enjoy the festivities from the water, don't despair. Fun Zone Boat Company and Newport Parade Boats take their guests right into the middle of the action. Reserve with them as early as you can. Newport Landing Restaurant, 503 E. Edgewater Ave. If you want to watch the parade from the comfort of a hotel room, you only have one option. Book a waterside room at the Balboa Bay Club. The parade takes place in Newport Beach, around the harbor and Balboa Island just off the Pacific Coast Highway. You can get there from I-405 by taking the Jamboree Road exit, but many other routes will also work. Set your map program or GPS to Balboa Island for a good start. If you're driving to the parade, go early. Traffic gets quite busy starting about two hours before the parade begins and all of the roads going toward Balboa Island will be packed. Some local hotels and accommodations in and around Newport Beach offer free shuttle service to the parade. Orange County's other waterfront Christmas extravaganza is the Huntington Beach Cruise of Lights, but you can find even more things to do during the holidays including where to find surfing Santas and land-based holiday lights — just check the guide to things to do in Orange County at Christmas.